Tyler Kord's (Culinary '02) new restaurant, No. 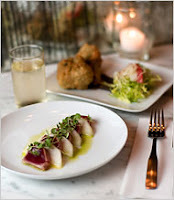 7, received a favorable review from Pete Wells of the New York Times. Prior to opening No. 7 in Brooklyn, Tyler was Sous Chef at Perry Street in New York. Read the review here.